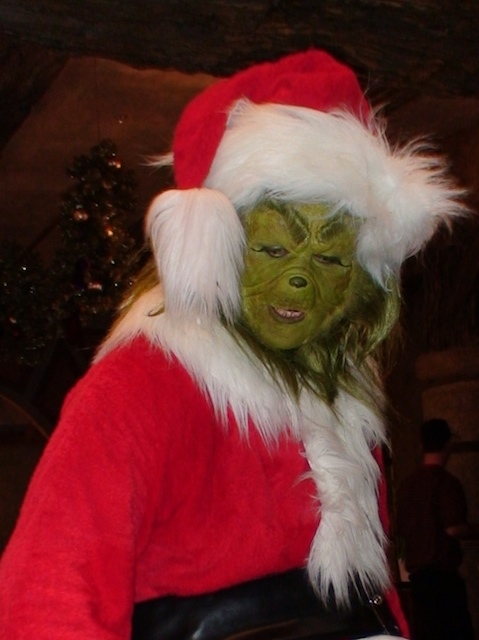 Universal Orlando focuses much of it’s holiday offerings around “Grinchmas” – taken from the Dr. Seuss story “How the Grinch Stole Christmas”. All of Seuss Landing at Islands of Adventure is decorated for the holidays (it’s also the ONLY area in IoA that is), and this year Universal is offering a character meal featuring the Grinch, Things 1 & 2, the Cat in the Hat, and Cindy Lou Who at Confiscos Grille (just inside the parks main entrance). Let me start by saying that eating at Universal is always a crap shoot – you’re never quite sure what you’re going to get. This is a buffet meal that features pretty standard fare – muffins and croissants, grits, scrambled eggs, sausage & bacon, waffles, French toast and cereal. 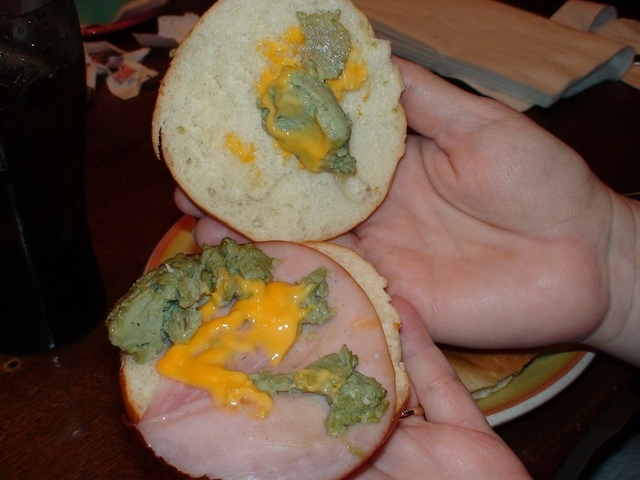 The one unique item on this buffet was the ‘Green Eggs & Ham’ sandwich, as popularized in the Seuss story of the same name – we’ll get to that in a second. As we started eating breakfast, it became apparent that the success of this meal would rely more on character interaction than the food. The food wasn’t bad – the eggs were a bit runny, the sausage was on the greasy side – the pastries were good, but nothing here was outstanding or extraordinary – that is, until I took a bite of the ‘green eggs and ham’ sandwich. To start with, you need to look past the way this sandwich appears when you open it. The green eggs can only be described as looking like some small animal went to the bathroom on your breakfast after eating something it shouldn’t have. Sorry to be so graphic, but perhaps you can come up with a better analogy after looking at the picture below. Okay, as long as I didn’t think about it too much, I was able to take a bite of the sandwich – it was only then that I realized – THERE WAS SPINACH IN MY EGGS!!! I hate spinach – no, scratch that – I LOATHE SPINACH WITH A PASSION. I hate everything about spinach – the color, the texture, but most of all the taste – and if your child is like many others, they feel the same way about it. Wouldn’t common sense dictate that you keep spinach away from a breakfast buffet aimed at kids? Especially kids that would be drawn to an item like “green eggs”? Wouldn’t green food coloring work just as well? Upon realizing that the vile weed had infested my breakfast sandwich, I spit it out into my napkin and desperately grabbed any beverage I could to extricate the taste from my mouth. In fairness, I have to admit I was already in a crappy mood when I arrived – it was 9:30 in the morning, getting thru the turnstiles at IoA was a trying experience to say the least (really, how hard does scanning a ticket and walking thru a turnstile have to be?) Plus, it was my birthday and I wanted to be back in bed sleeping, not traipsing into a theme park. Then of course – THEY PUT SPINACH IN MY EGGS – so yeah, I was definitely not going to be a contestant for the Mr. Congeniality pageant. At this point in the meal, I’m saying to myself that the character interaction had better be somewhere north of fantastic, or I’m going to trash this buffet until the day I die. So I waited for characters to come to our table….and waited…and waited. It wasn’t that there were no characters around – they were everywhere, they just weren’t stopping at our table. Perhaps they moonlighted as spinach farmers and sensing my ‘spinach hatred’ were afraid of me. Eventually, I grabbed a manager and with a tone of voice only a true spinach-hater who just found spinach in his eggs could muster – I told him “we’ve been here 40 minutes and not one of these characters has stopped by my table”. In order to get the full picture, say that under your breath with your teeth firmly clenched and the taste of SPINACH still in your mouth. At this point, there was no hope in my mind that I was walking out of here with a positive experience. I was already writing this blog entry with titles like “Green Dump and Ham” or “There’s SPINACH in my freakin’ EGGS!”. I’ve been to a lot of character meals in my day – in fact, I’ve been to virtually every one of them offered in Orlando and in the 20 years I’ve been visiting Orlando theme parks – I have NEVER and I mean NEVER seen character interaction like this. Whoever is playing the Grinch not only deserves a raise, he needs his own three picture deal. He was HILARIOUS – he spent at least 5 minutes at our table and suddenly I wasn’t thinking about spinach, or wanting to sleep in on my birthday, or people that can’t navigate turnstiles – I was laughing… a lot, and watching my neices and nephew and family laughing…a lot (don’t take my word for it – watch the video – How the Grinch Saved Breakfast). 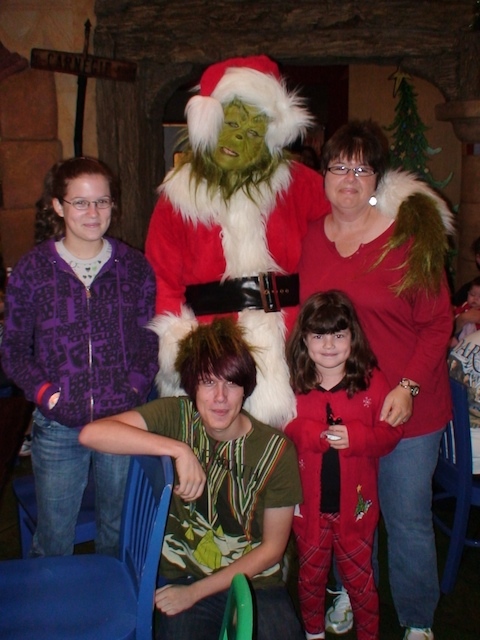 We had told the Grinch that my nephew Max was named after his dog – he took it from there. But this kindof interaction wasn’t limited to our table – he engaged every table in the place. He had talent and character for DAYS and had the entire restaurant laughing. The character interaction at this meal went well beyond the ‘stand and pose’ picture taking that most character meals deliver. All of the characters were fun, and particularly playful . It was worth waiting 40 minutes for this, and I never thought I’d live to see the day I’d say it – but I’m happy to overlook the mediocre food and ‘green dump and ham’ sandwich we were served. Even the “Whoville” characters were charming, although they all looked like rhinoplasty gone terribly wrong. I also have to say the staff was particularly good – our server Tiffany was very sweet and had drinks and refills to our table very quickly. She even apologized for the spinach in the eggs when she saw me spit it out of my mouth. The manager (having no idea who we were or what we did for a living) clearly wanted to make sure we had a great character experience, and made sure it happened. It was obvious to even the most jaded guest (and I certainly fit that description) that the staff was dedicated to making the experience special for each guest, and that goes a long way with me. Given the number of character meals in this town that boil down to “here’s Mickey Mouse and some crappy food, now give me 20 bucks” – this was a refreshing and enjoyable change of pace. For our party of 7 (4 adults and 3 children) with my annual pass discount, the total came to $136 (including tip). If you’re in Orlando for the holidays, you should really make a point of experiencing this. Manage your expectations with the food and GO GO GO for the characters – it’s worth every penny. The Grinch may have stolen Christmas – but he sure saved our breakfast!